Apple is bucking industry trends and outperforming its peers by creating its own growth through hardware and software innovation  an aggressive strategy that one analyst believes could lead to Apple phasing out the $400 iPad 2. Rob Cihra with Evercore Partners said in a note to investors this week that he sees Apple phasing out the current iPad 2, because Apple's overall vision calls for "clearer product tiers." The prediction comes as Apple is expected to lower the barrier to entry of its iPad lineup by unveiling a new, smaller iPad next Tuesday. Cihra believes Apple will sell around 7 million so-called "iPad mini" units in the December quarter. Along with the full-size iPad, he sees Apple selling a total of 26 million units in the holiday shopping season. In his view, Apple is leveraging its engineering expertise in both hardware and software to "pull dollars away from otherwise commodity markets and incumbent competitors." Apple's calendar year 2012 revenues are up 30 percent year over year, while the broader PC market has dropped 4 percent this year. Further bolstered by sales of 49 million iPhones, Apple is expected by Cihra to post $56.1 billion in revenue during the December quarter, amounting to $16.33 in earnings per share. 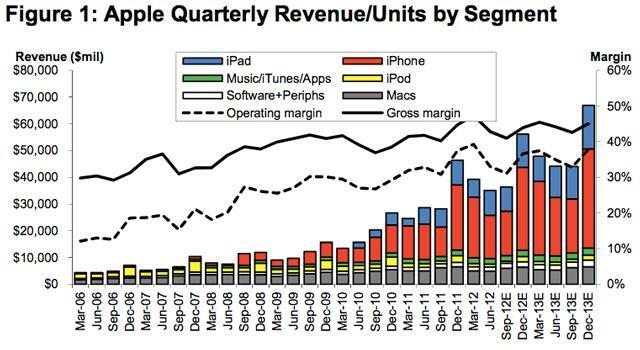 Prior to that anticipated blockbuster quarter, Apple will report results for its just-concluded September quarter. For that three-month frame, Cihra believes Apple sold 27 million iPhones, 17 million iPads, 4.9 million Macs and 5.7 million iPods, resulting in revenue of $36.5 billion and earnings per share of $9.03. His numbers are slightly above Wall Street consensus for the September quarter, as other analysts on average seek $36.4 billion in revenue and $8.93 earnings per share. Evercore Partners has reiterated its overweight rating for AAPL stock, as well as a target price of $800.